Phoenix Horticulture Specialists | Edgewater Design Co. Designing any landscaping project in Arizona begins by choosing the right company to design, install and maintain it properly. Although there are several professional landscape architects that can create an elegant-looking design with several beautiful water and rock features, it takes a horticulturist or horticulture specialist to ensure the project is completed correctly – and lasts for years. When you can find a landscape design company in Phoenix that has experienced landscape architects; and educated horticulturists, your chances of having a long-lasting and elegant landscaping project vastly improves. Edgewater Design Company was founded by Matt Palmer, who earned his college degree in Horticulture. His ability to understand the chemistry and biology of not only the plants and grass, but minerals and other elements in dirt. This experience permits him to select the right plants for each individual property, and how to infuse design elements from location, hydration and other factors to ensure proper cultivation of the plants and soil. Expert knowledge and a passion for horticulture is exactly what you need for your plant life. Give the EDC team a call with your questions, (480) 389-7114. Why is a Horticulturist Better than a Landscape Architect? There are several reasons why an experienced horticulturist is best suited to design and install any landscaping or hardscaping project in Arizona. First and foremost, when a horticulturist is on the job, it simplifies the design process. It’s common for a traditional landscape architect to design a layout, but they will commonly consult with a horticulturist to ensure their layout and design “holds water” so to speak. Horticulturists conduct research and frequently update their education on plant cultivation and propagation, plant physiology and biochemistry. They use this data to ensure the correct placement of all materials for maximum growth, health and longevity. Saves you money: Since a horticulturist is typically needed to consult with a standard landscape design firm at rates between $100 to $250 per hour, those charges typically end up on the customer’s bill. When a company like EDC completes the design phase, our in-house horticulture expert is already on the job, which reduces design time, ensures quality and saves you money. 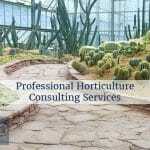 Reduces dying plants: A certified horticulturist is professionally trained to create beautiful landscapes by incorporating the proper plant and tree placement and selection based on the soil type, property slope, drainage, nutritional value of the soil, resistance to disease, insects and environmental stress. This ensures the plants and trees used in your landscaping project life healthy – and for longer periods of time. Ensures a Fresh & Lively Landscape: A horticulture specialist not only knows how to correctly place and select the right vegetation, but also maintain the property as well. Edgewater Design Company offers full landscaping design, installation and maintenance. By knowing how to maintain, prune, trim and clear debris on your property with recommended maintenance, your landscape will continue to look fresh and clean throughout the year. Creating a new or upgraded landscaping project is an investment that you’ll want to protect. By working with Edgewater Design Company and our founder and professional horticulturist Matt Palmer, you can feel comfortable knowing the project is designed, installed and maintained by a proven professional. Our dedication to quality in all aspects of our business, plus our dedication to superior service truly separates EDC from competitors. Trust your landscape with Arizona’s knowledge experts on horticulture services at EDC. Give us a call at (480) 389-7114.